Meditation is a time-honored art that will help increase and enhance a person’s inner peace and sense of well-being; as well as their overall state of mental, physical and emotional wellness. Yet meditation can only help if you do it properly. With this in mind, it is important to learn and perfect the top tips to help you meditate. Sometimes meditation is seen as a cultural trend or hobby; and it can indeed be a relaxing and enjoyable past time for many people, who may choose to share their new interest with friends and family members. While this is wonderful, only those who truly believe and invest themselves in the power of meditation can truly reap its benefits. Meditation is not a fashion, but a timeless tradition that can change your life. Meditate, not to fit in, but to be healthier, wiser, and more at peace with your world. Once one learns in detail about the rich background of the meditative practice—one that is steeped in Buddhist tradition—they are more likely to comprehend and appreciate the practice itself. By looking up the history of meditation in books, on the Internet, or by partaking in CDs and DVDs on the subject, they will learn how people throughout the years have discovered, developed and adapted this practice to best effect. 3. Learn the Benefits of Meditation. When you meet a person who meditates, you may not even have to ask them about the intense and immediate rewards of this process. You may notice immediately that they are kinder, more patient, more peaceful, and healthier than others around them. These are only some of the benefits of meditation, which has been used both as an everyday tool of lifestyle enhancement and a form of therapy for those facing mental, emotional and physical illnesses and difficulties. If you don’t know people who meditate, you can glean knowledge of its many benefits by talking to medical physicians, psychologists, and of course meditation teachers about the subject. 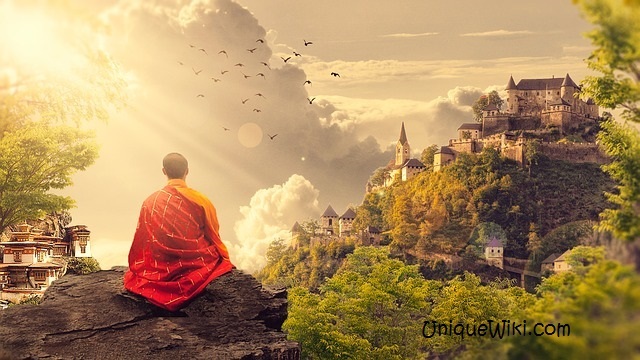 Contrary to what may be popular belief, the practice of meditation does not involve the simple act of crossing one’s legs and chanting, “Ommmm….” Although not a complicated procedure, meditation is a practice that involves certain designated physical positions, breathing techniques, Buddhist-based theories, and specific means of visualization and relaxation. All of these can be learned by attending an in-depth meditation class, or—once again—by studying various books and electronic instructional materials on the subject. 5. Pick a Place to Meditate. Once you have decided to make meditation a part of your life, then you should decide where to meditate. You may wish to select a place that is quiet, softly lit, clean, and devoid of noise or possible disruptions. This could be your bedroom, garden, study or exercise room; just keep in mind that, even in our homes, we are liable to encounter certain distractions that include ringing telephones, loud children, TVs and stereos that play from adjoining rooms, etc. With this in mind, you may instead wish to practice this time-honored art at a designated mediation center, yoga studio, or Buddhist retreat. 6. Eat Right Before You Meditate. Before you meditate, be sure to eat a light but satisfying meal. After all, once you set off on your meditative journey, you do not want to be distracted by either heartburn or hunger pangs. Indeed, the maintenance of healthy eating habits—and abstinence from the consumption of alcohol and illegal drugs—are strongly advised for people who truly wish to get the most from meditation. No, you don’t have to don a flowing, Buddhist-style robe before you meditate. :) Yet it might help to put on some comfortable, loose-fitting clothes—and to remove any jewelry that might prove heavy, clanking or distracting during the meditative process. Do your best to clear your mind of its stresses and worries; transporting yourself to a place of peace and tranquility. Get yourself in the mood for meditation; a positive mindset that will induce a state of rest and inner wellness. While the classic lotus and the half lotus are popular, your ideal position will depend on your age, the state of your health, your overall level of flexibility, and your personal comfort levels. Also remember that the right meditative position will involve the correct placement of every limb, including your legs, your chest, your abdomen, your buttocks, and your hands. Once you take the plunge into a meditative lifestyle, you will immediately begin to reap the benefits of this beautiful, time-honored practice. Remember your mind is your instrument. Learn to be its master and not its slave! Previous post: How to Boost your Energy Level with Alkaline Diet?